A quick and easy ice cream to make with just bananas, Nutella and vanilla extract! Place all the ingredients into the TM bowl and mix for 40 sec/speed 9. Open the lid and scrape down the bowl if necessary and mix again. I find that 40 seconds is enough for a smooth consistency. 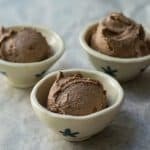 You can store the Thermomix Nutella Icecream in the freezer – just thaw out for 20 minutes before consuming.